Is it possible to check if my windows computer is having internet connectivity or not? How to find out the gate way address of my router? Re: How to check if windows computer is having internet connectivity or not? It is possible to check if your computer is having internet connectivity or not. For this, the first and most simple option is to open any one of the internet browser and try to visit a website. If you are not able to see a website then you need to proceed to the next step. Now on the windows computer you need to go to the start menu and then to the control panel. In the control panel you will find an option called Network and Sharing Center. There on the left pane there will be an option called change adapter settings. Inside adapter setting you will find the various adapters and the status if it is connected or disconnected. Right click on the one which shows connected and click on status. In the new window you need to click on details. In the windows that pops up you will find the iPV 4 gateway. That would be your address of the router. It is very simple to check the internet connectivity on your computer. Please follow these steps and it will be piece of cake. 1)Click on the button which is present on the right bottom of your computer scree. 2)It is just adjacent to the time. 3)There will be a network icon present . 4)Now "Right click" on that icon and select open network and sharing. 5)It will bring you to a screen like this one. 6)If you see that there is a link between the computer icon to the house icon and than to the globe. 7)It means your computer has internet connectivity. 1)Follow the steps from 1 to 4 as above till you reach the screen as shown in the image. 2)After than click on the Local area connection. 5)Click on the properties and this kind of box will open. 7)You will get your default gateway IP. In windows 7, the notification area networking icon will show an error indicator if there is no internet access and the error icon goes away once there is a successful connection to the internet . sometimes, if the WiFi connection requires an in-browsing authentication step, like on many guest networks in hotels or universities,then the follow pop-up bubble appears, saying as much. If you are running windows 7 in your PC, just open Network and Sharing Center. It will show whether the network from which you are currently connected has Internet Access or not. Alternate option is that, just Beside Time in the Taskbar, there is an icon that shows Network, check whether it is written Internet Access or not. If yes, then you can access Internet. if this command shows like reply from <some ip> ....etc then your internet connection is working fine. if it shows request timed out then it is confirmed that your internet is not working. if your internet service provider allocates ip dynamically then verify the ip that we got in step 3 and given by your isp are same or not. if your internet service provider allocates ip statically check the ip you have given is correct or not and make sure that your DNS servers are correct. 1. Just look at the taskbar at the bottom of desktop. 2. Another way to check is : Open Task Manager. Click on Connection tab, it will show you all active internet connection with status. The RED X represent no internet connection. Click the Pearl button.On the Start Search field,enter "cmd" then press "Enter". On the Command Prompt window,enter "ping yahoo.com" or any website of your choice then press "Enter". 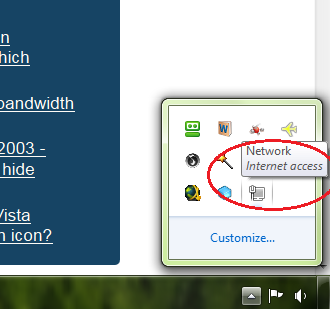 -->After Successfully pinging a website,proceed in checking the computer's Internet connection by accessing a website..
yes u r able to chalk that ur computer are connect with network....just click on this icon (yellow mark icon) u can see all info. Ping test is the most simplest method to check connectivity to the internet. Open command prompt by typing cmd in Run menu. If it generated the message all packets transmitted successfully and zero packets dropped then your connection is good and you have internet access. To find the IP of your router type the command ipconfig /all in the same command prompt window. The default gateway is the IP address of your router. To check first go to start--->contol panel--->Network connections.Here you can see whether net is connected or not. Go to any browser like IE or any and do surf,by this way also you find. Open Control panel from Start menu . After Opening Control panel click on the Networks and Internet option. After clicking that option the Networks and Internet page gets opened. In that page click on the View network status and tasks option which is below the Network and sharing center . Select the Change Adapter Settings option from that options. when you click on that option you will be redirect to a page where the internet connection system Icon will be shown. If the blue light is shifting from one screen to another then it mean`s that your system is connected to Internet . Another option is to right click on that system icon and view the Status option . When you view the Status option if the a window gets opened and there is a change in sending and receiving bytes then your system is connected to Internet. Some times when you open that page where the internet connection system Icon will be shown , the System Icon will be brured or a cross mark will be shown on that system Icon that mean that your system is not connect to any internet connection. Check in View your Active Networks. In Windows 7, at the extreme left in the bottom of the screen there is a notification area network . If the notification area networking icon shows an error indicator if there is no internet access , and the error icon goes away once there is a successful connection to the internet . Show wen you are connected to the network then the notification area will be with no error indication . If you want to see your network connectivity then follow the steps. Go to control panel>network and sharing center. There you can see the network visiblity. Right click on LAN. and choose "propertise". there is a option name "IP v 4". Choose it . And type your IP name . And solve your problem. its simple to check weather the internet connection is active in your system or not. firstly open any browser and search for any website,if the website connects.......then your system is able to connect to internet. its just like two pcs blinking together....when this process is happening then you are connected to internet. 3.select network and sharing center. 5.Right click on LAN. select ->properties. 6. Choose ->IP v 4.
do you want to know internet connection is there or not in windows computer following some steps. 4.now click on the network and sharing center. If you are finding that hoe to check if windows computer having internet connectivity or not..
1.First of all click on the windows button and then select and click on the control panel ..
3. Know here you can check all the details of your Network..
4.And then you can check in view your networks setting or Active networks. is working or it says that timed out so your network is not working. For checking we have number of ways..
See on Task bar internet icon It doesn't having any mark then internet is running. Open internet Explorer from the start menu.. If Google page not open then internet not working.. It is attainable to ascertain if your pc has net property or not. For this, the primary and most straightforward possibility is to open anyone of the web browser and take a look at to go to an internet site. If you're not capable to ascertain an internet site then you would like to proceed to following step. currently on the windows pc you would like to travel to the beginning menu so to the board. within the board you'll notice associate degree possibility known as Network and Sharing Center. There on the left pane there'll be associate degree possibility known as amendment adapter settings. within adapter setting you'll notice the assorted adapters and also the standing if it's connected or disconnected. Right click on the one that shows connected and click on on standing. within the new window you would like to click on details. within the windows that pops up you'll notice the IPV four entree. that may be your address of the router. If you're running windows seven in your computer, simply open Network and Sharing Center. it'll show whether or not the network from that you're presently connected has net Access or not. Alternate possibility is that, simply Beside Time within the Taskbar, there's associate degree icon that shows Network, check whether or not it's written net Access or not. If yes, then you'll be able to access net. 1. click on internet explorer and type a site address in the address bar and click to surf. It will fail with a message. 2. From the Command Prompt type "ping google.com". There will be no pinging and it will tell you. 3. there will be no icon notification on the task bar right corner. 4. Go to Control Panel > Network and Shareing Center > Adapter settings > here you will see adapters , click to know the status of them . If you are having an exclamation mark on the notification monitor then you need to troubleshoot the Internet connectivity! If the packets are sending and the receiving with out any issue then you can conclude that you have internet connectivity! If your system pings then you will get a reply. IF reply came then you can conclude that you have internet connectivity! Reset your modem and router. Remove the power cord from the modem and/or router, wait at least 10 seconds, and then plug the modem and/or router back in. Check your router. Because of the new networking features in Windows Vista, some older network routers are not fully compatible with Windows Vista and can cause problems. By default, most router manufacturers use 192.168.0.1 or 192.168.1.1 as the default LAN IP address. This is the address you would enter into your browser's address bar to access the router configuration page. Yeah! I have got your problem and I have the right solution for it. 2.Now click on the option of 'Control panel' tab. 3.Now click on the option of 'Network & Internet connections' tab. 4.Now click on the option of 'network connections' tab. 5.After that give a right click on the 'Local area network' option. 6.Now click on the option of 'Status' tab. first and most simple option is to open any one of the internet browser and try to visit a website. If you are not able to see a website then you need to proceed to the next step. Now on the windows computer you need to go to the start menu and then to the control panel. In the control panel you will find an option called Network and Sharing Center. There on the left pane there will be an option called change adapter settings. Inside adapter setting you will find the various adapters and the status if it is connected or disconnected. Right click on the one which shows connected and click on status. In the new window you need to click on details. In the windows that pops up you will find the iPV 4 gateway. That would be your address of the router. 2.Then you click on the option 'Network and Internet Connections'. 3.Then you click on the option 'Network Connections'. 4.There you can see the internet connection is there or not. 5.If there is no connection then it will show the red cross mark. 6.If it is connected it will show connected. 2. Click on the option of 'Control panel' tab. 3. Click on the option of 'Network & Internet connections' tab. 4. Click on the option of 'network connections' tab. 5. Right click on the 'Local area network' option. 6. Click on the option of 'Status' tab. 3rd==select network and sharing center. 5th==Right click on LAN. select ->properties. The following is the procedure for solving the problem of check if windows computer is having internet connectivity or not. Now press the 'network and internet connections' option. There the option of 'network connections' is to be selected. After that you need to go to the LAN(Local Area Network) by pressing the right click on it. Then the 'status' option is to be tapped. Now you can see all the details of the connection.